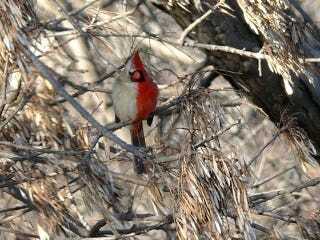 This bi-colored northern cardinal has female plumage on its right, and male plumage on its left. Called a "gynandromorph," these animals are rare in nature. Rarer still is the chance to study one for extended periods of time — but researchers recently had such a chance with the bird you see here. The bird exhibited the typical bright red color of a male cardinal on the left half of its body, and the dull brownish-gray appearance of a female cardinal on the right half. We observed the bird... mostly in the vicinity of bird feeders. It was never paired with another cardinal, was never heard vocalizing, and was not subjected to any unusual agonistic behaviors from other cardinals. These observations are among the most extensive of any bilateral gynandromorph bird in the wild. Gynandromorphism isn't known to occur in humans, but is sometimes expressed in birds, crustaceans, arachnids, and insects.